This is Queen Elizabeth on her first visit to Hood River after her coronation. OK, just a little April Fools fun. 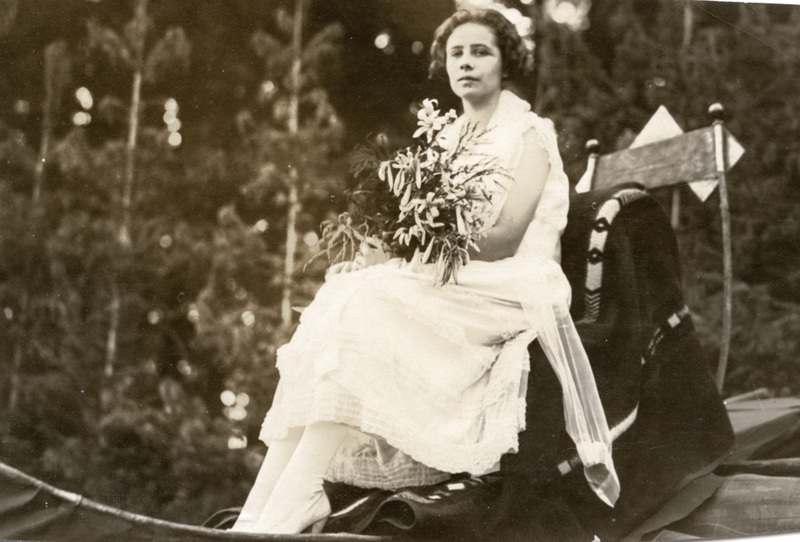 Its actually Queen Reta (Miss Reta Kelly) of the Parkdale Strawberry Festival, as photographed by Fred Donnerberg for The Hood River Glacier, making this a pre-1934 image. She was native to the Parkdale area. Her parents were Ambrose and Catherine Kelly. Her married name was Kitchel. For a time she worked at McIsaac's though she had studied to be a beautician. Her husband worked for Oregon Lumber at Dee, later for Hines. She owned and operated the store at the Dell mill for many years. Beautiful bouquet of Mt Hood Lily's the Queen was holding. I am trying to figure out what she is sitting on?? A toboggan with a Pendleton blanket? The June 14, 1925 issue of the Oregonian says Miss Reta Kelly, a Parkdale high school girl, daughter of A.M. Kelly has been chosen queen of the annual strawberry festival at Parkdale. She will be crowned at the close of berry harvest. The June 28, 1925 issue, covers the event with poetic language and several photos from Donnerberg. "In a jewel-like setting, with the eastern foothills turning from gray and brown to deep purple, as daylight gave way to twilight, and thousands of stars peeped out from the canopy of heaven and silvered the snowfields of the sentinel Mount Hood....."
The event was attended by more than 2,000 spectators on the Parkdale grade school lawn. The Hood River motorists were led by the Pythian band. Pupils of Miss Alys May Brown performed dancing. I will list the dancers here, just because the names might be of interest to some of you. Virginia Moore, Jane Unger, Grace Mary Gordon, Clara Koberg, Peggy Baldwin, Dorothy Anderson, Dorothy Unger, Allene Culbertson, Peggy Edwards, Chiiquita Winkler, Janice Benton, Helen Copple, Carol Hurlburt, Marion Knoblock, Emily Benedict, Allison McLucas, Mary Steinhauser, Kathleen and Editha Hartwig, Lila Pike, Grace Rieckman, Dorothy House, Matilda Knoll, and Dorthy Garrabrandt. A June 17th article says the Mount Hood Loop road is closed by snow drifts. If the bureau of public roads will allow, volunteers from Parkdale will go out with horses, tractors, trucks, and scrapers and make short work of the drifts to open the road for the festival. You are so timely ! I like your Queen Elizabeth April Fool's Day comment!